He was born on 18 July 1918 in Mvezo. His full name is Nelson Rolihlahla Mandela. His surname Mandela was taken from his grandfather. His father died of TB or tuberculosis when he was 9 years of age. He completed his Junior Certificate in two years, instead of the usual three. He enrolled at the University College of Fort Hare for the Bachelor of Arts Degree where he was elected onto the Student's Representative Council. He was suspended from college for joining in a protest boycott. Before his presidency, Mandela was an anti-apartheid activist, and the leader of Umkhonto we Sizwe, the armed wing of the African National Congress (ANC). In 1962 he was arrested and convicted of sabotage and other charges, and sentenced to life in prison. Mandela served 27 years in prison, spending many of these years on Robben Island. In his spare time, Nelson Mandela studied to become a Lawyer. In South Africa, Mandela is often known as Madiba. Mandela has received more than 250 awards over four decades, including the 1993 Nobel Peace Prize. He has honorary degrees from more than 50 international universities. 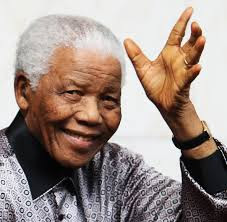 In 2009, the UN General Assembly declared July 18 (Nelson's birthday) as Mandela Day to mark his contribution to world freedom. He was the first living person to be made an honorary Canadian citizen in 2001. His biography is titled 'Long Walk to Freedom' and was published in 1994. Invictus, a film directed by Clint Eastwood, and featured Morgan Freeman as Mandela and Matt Damon as Pienaar. A statue of Mandela was unveiled at Parliament Square in London in August 2007. His first marriage was to Evelyn Ntoko Mase but the couple broke up in 1957 after 13 years. His second marriage was to Winnie Madikizela, first black social worker of Johannesburg. They had two daughters. The union ended in a divorce in 1996. His third marriage was to Graca Machel in 1998. He was 80 year-old when she married Graca. Mandela was diagnosed and treated for prostate cancer in 2001. He retired from public life in June 1999 and currently resides in his birth place. During the 2010 FIFA World Cup in South Africa, Nelson Mandela made a rare public appearance during the closing ceremony and was warmly applauded. He was the oldest elected President of South Africa when he took office at the age of 75 in 1994. After his term, he gave way to Thabo Mbeki. In 1988, USSR released a commemorative stamp on him as a fighter for liberation of South Africa.